FRESNO, Calif. (KFSN) -- The City of Fresno announced Monday the launch of daily non-stop air service between Fresno Yosemite International Airport (FAT) and Chicago O'Hare International Airport (ORD) beginning June 7, 2018. The new route will connect California's Central Valley to the Midwest as well as the East Coast and European destinations. Ranked as the third largest city in the United States, Chicago serves as headquarters to several Fortune 500 companies and a variety of tourism attractions. "United Airlines is looking forward to connecting more customers to California's Central Valley," said Grant Whitney, United's vice president of Domestic Network Planning. "Our new service offers customers another convenient choice to get to Fresno and Yosemite National Park from the Midwest." 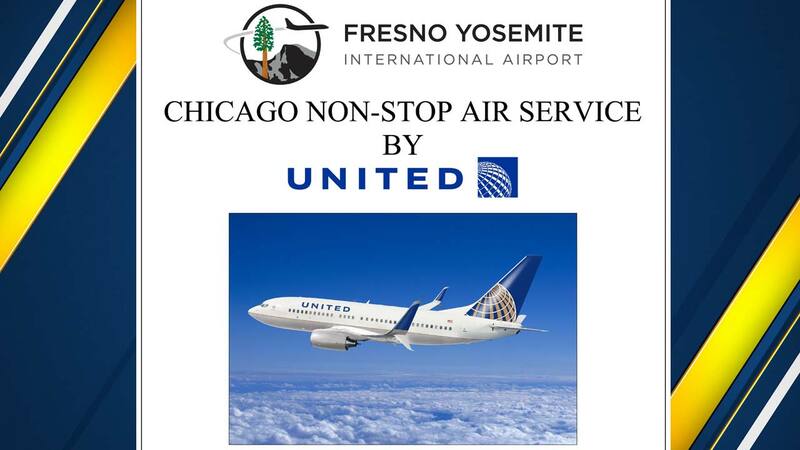 United Airlines' commitment to provide non-stop service between Fresno Yosemite International Airport and Chicago O'Hare International Airport creates the opportunity for bridging future business prospects between the Central Valley and the Midwest while fulfilling a highly desired route for today's travelers.